This card is quite versatile as you can use it in a couple of ways. First of all, you can easily clear your opponent's field with this card, and use that opportunity to do some quick unblockable hits. 2nd of all, you can also use it bounce back flip effects Monsters like Magician of Faith after flipping it so that you can reuse the effect again. You can also bounce back Exodia Pieces to your hand after your Reborn them. Finally, the effect can be reused over and over again if you simply choose Penguin Soldier as one of the Monsters to be returned (assuming that it doesn't die of course). This monster lets you return up to 2 monsters when it is flipped. This monster is really awesome. It's so much better than hane-hane. For 1 thing, you can return up to 2 monsters, which allows you to set up a lockdown by returning the opponent's monster and your penguin just to set the penguin back down again. Even better, is that you are not required to return 2 monsters. You can return 1 or 0. This can come in handy if you just want to return the 1 opponent's monster and sacrifice penguin for a tribute monster. Or if the opponent uses SORL, you can return no monsters so that none of your defenders are returned to your hand. Plus there's also the benefit of getting back your own monsters if the opponent uses monster reborn on them or something similar. Now that we're now reviewing tournament pack cards until TP4 (hopefully =/), we can go back to cards that normal people can afford, like this one, which just happens to be one of my favorite monsters. Think Hane-Hane. Remember how much that card sucked? It was basically a 1 for 1 trade, which is not good for getting field advantage. 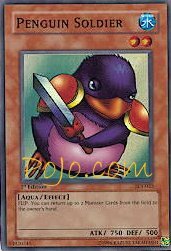 Penguin Soldier gives you a 2 for 1 trade, which is very nice card advantage. Being able to recycle itself, Magician of Faith, etc. is nice too. Makes your opponent really mad when they have to send their Jinzo/BEWD/Masked Beast/Last Warrior back to their hand/Fusion deck. Me like. Lady Poet Today's cotd is Penguin soldier. He sends two monsters back to their owners hands. This guy can cause real havoc because he can easily clear fields. Basically, this card is just a pumped up hane-hane. Monster advantage is quite important in this game as of now. I think you can put him in your deck, it's probably just a question of whether you have room or not.